A fundraiser for the Cancer Council will be held at Drouin Home Timber & Hardware today. Staff member Will Burrell has committed to shaving his head at the event to raise funds and awareness for the cause. 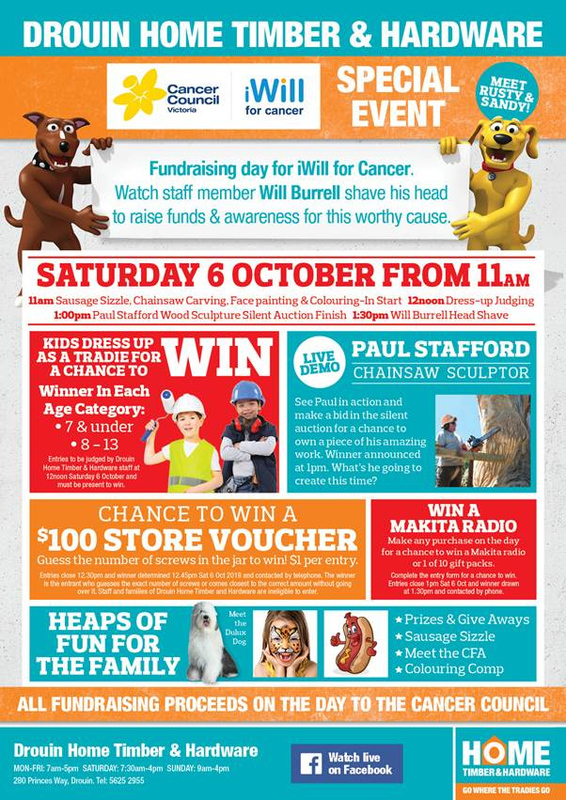 Other fundraising activities will include tradie dress-ups for kids, a live demonstration from chainsaw sculptor Paul Stafford with a silent auction for the end work, carnival-style guessing games, a sausage sizzle, face painting, and more. The event will kick off at 11am on 6 October, and will run until 1.30pm. A version of this article first appeared in our 27 September 2018 edition. Warragul Winterfest 2018 on TONIGHT!